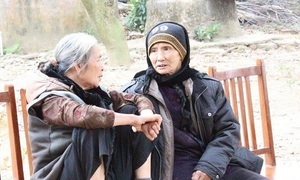 At 5:30 a.m. on December 24 of the lunar calendar (a week before Tet which will begin on February 5) at the entrance to the Chuong village pagoda in Phuong Trung Commune, Hanoi's rural Thanh Oai District, Hong and other villagers carefully select the bamboo brim of each hat and negotiate the price. 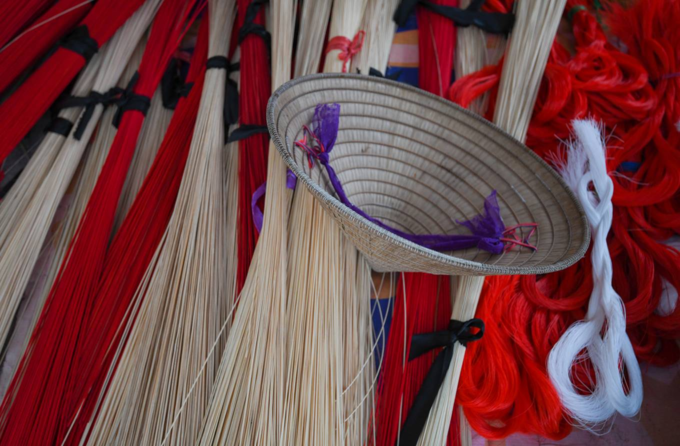 With more than three centuries of experience in making hats, Chuong village is famous for its completely handmade, durable, beautiful products that were chosen for kings in olden times. 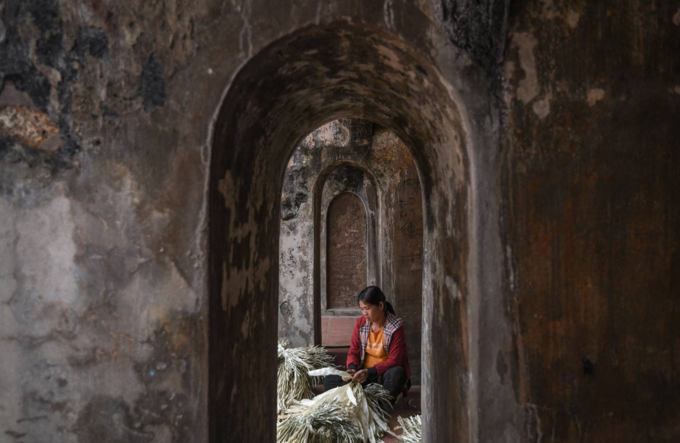 The market opens only three hours a day, six times a month, on the 4th, 10th, 14th, 20th, 24th, and 30th, to sell hats and materials supplied by craftsmen in villages around Hanoi. 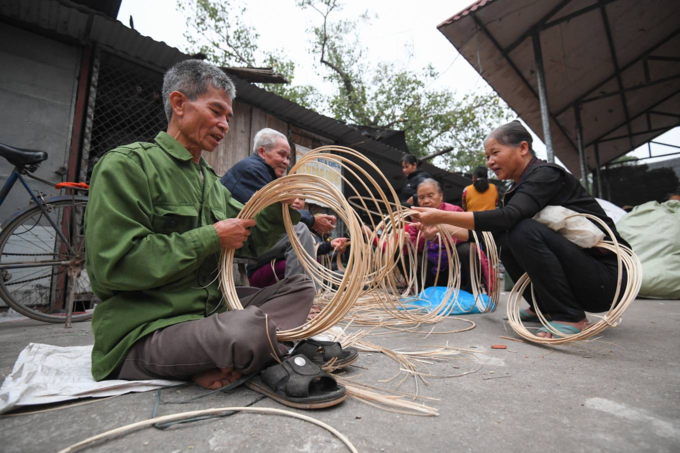 Nguyen Van Huu (L) and Thanh Oai (R), who have been making conical hats for more than 40 years, are introducing their products to customers. Huu can make 70 to 100 hats with handmade brims a day. 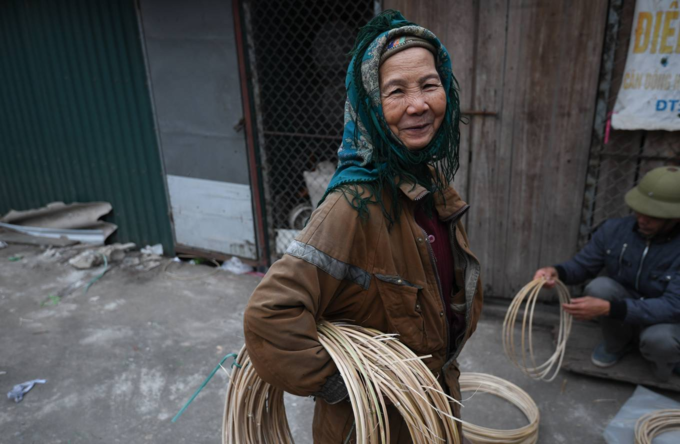 A brim costs VND1,200 - 2,200 (5.2 - 9.5 US cents) depending on the skill of the craftsman in crafting and selecting the bamboo. 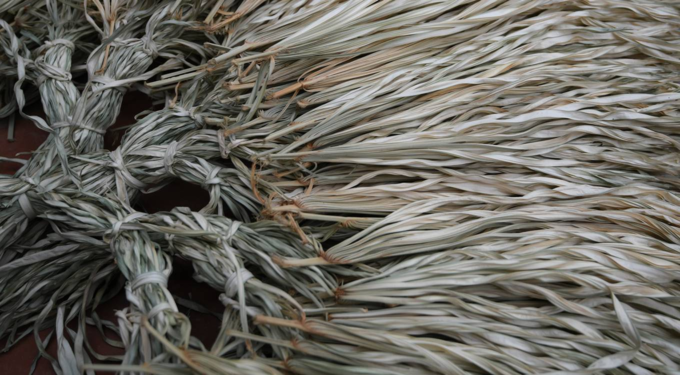 Slender cords, sewing threads and other materials required for making conical rings. 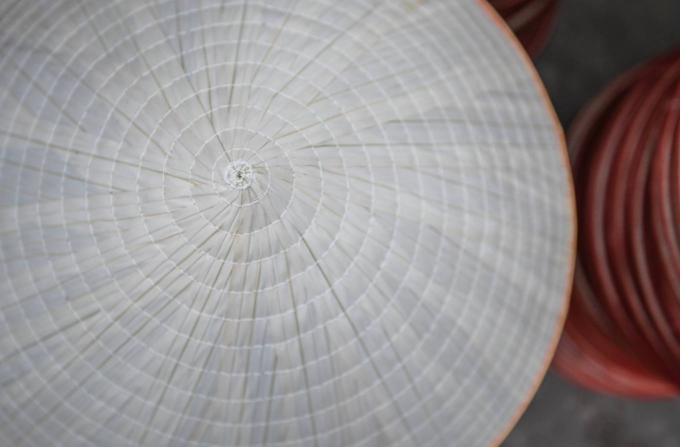 The conical hat of Chuong village has 16 rings, of which 15 are made with slender cords and one from bamboo to make the brim. Vien’s store specializes in selling conical frames. She says many tourists coming to the market are intrigued by this item and buy it as a souvenir. "They say they know about conical hats but never about conical frames." 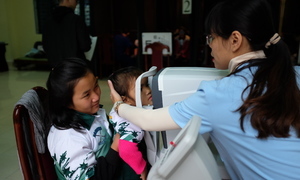 A frame costs VND70,000 - 90,000 ($3.02 - $3.88) depending on the size. The area selling palm leaves of Chuong village. The main material in the conical hat, the leaf, originates in the central region. In the mold, a layer of bambusa nutans is added between two layers of palm leaves to increase the hardness of the cone. 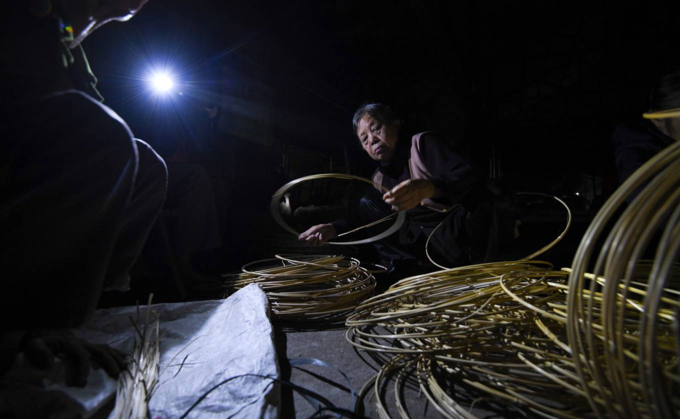 The palm leaves undergo a lot of processing before turning into finished products. The most unique step is the fumigation of leaves with sulfur so that they turn white. 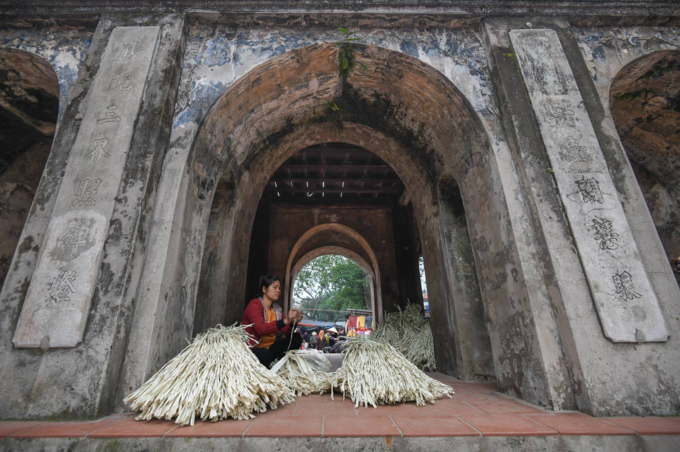 The sacks of leaves still smell very unpleasant when opened at the market, causing for visitors not familiar with it to cough or feel short of breath. In their free time, small business owners flatten the leaves to eliminate one task for customers. Dao Thi Son, 80, is holding the brims selected in the early morning. 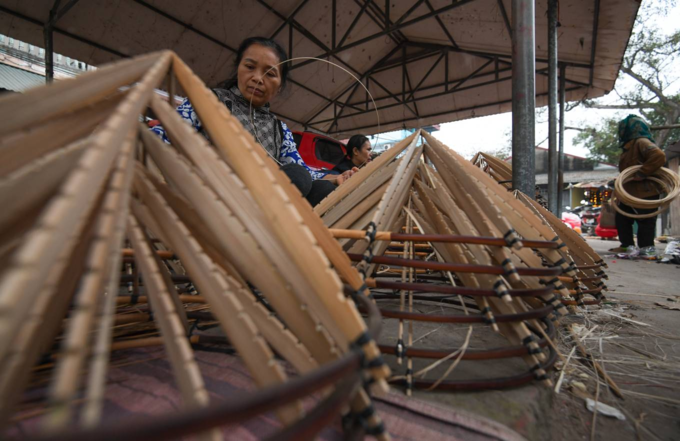 She says she has been making the conical hats for a living since childhood. Even now she makes two or three hats a day to "earn some money and preserve the traditional occupation." 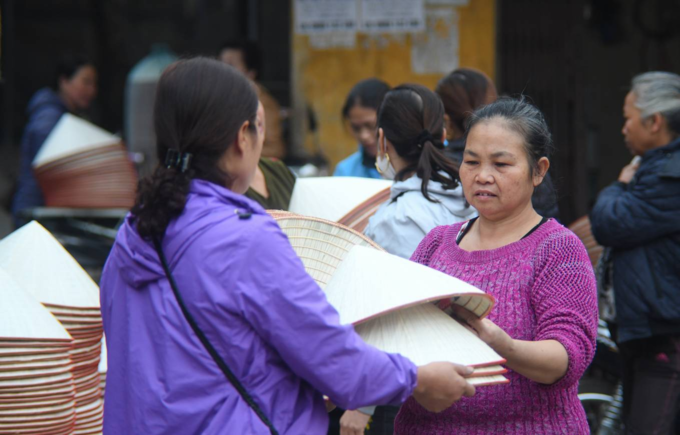 A conical hat sold in the market costs VND35,000 - 45,000 ($1.51 - $1.94). In the market, the hats are stacked up in piles to serve both individual and wholesale customers. A customer examines the hats in a seller’s hand. 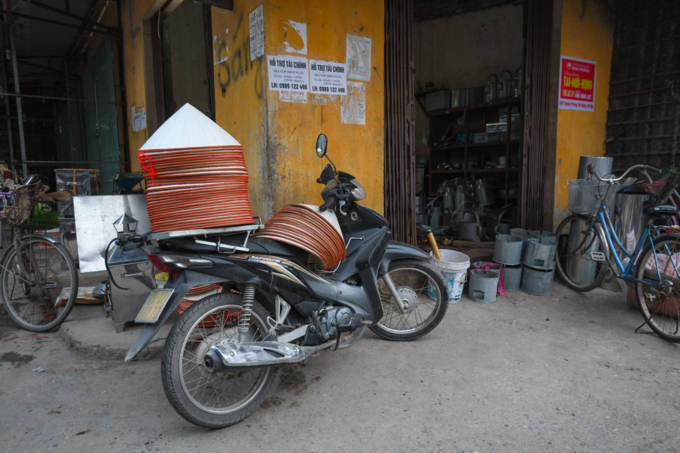 Duyen of Chuong village said: "The market opens for more than three hours, from 5:30 am to 9:00 am, but there are no good hats left if a customer comes at 7:00 a.m."
Sellers take advantage of every little space to display conical hats. They said unlike other markets Chuong village has fewer visitors at the year end. Luan, a vendor at the market for 50 years, said visitors do not come here in the last days of the year to buy anymore, so the market becomes more deserted. 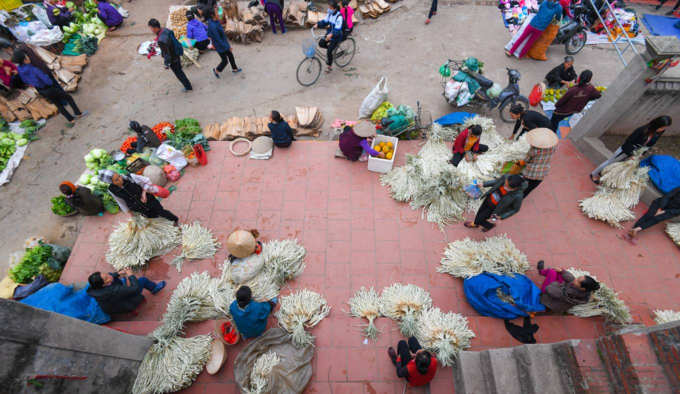 The peak season for Chuong village is mid-year. At the gate of of the Chuong village pagoda. Although it was once known as the "kingdom of conical hats," the village is facing the risk of losing the traditional occupation. 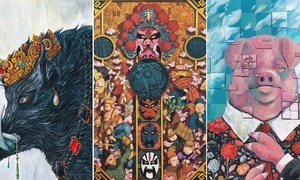 Hu said that just like in many other traditional craft villages young people today are less interested in making the hats because of the dwindling profits and lack of steady demand for them.